The bear hunter in the spring of '67. I must of had ten pounds on my belt and check out the G.I. packboard. So young! Only another five feet of climbing and I would be on the ridge with the bear. I grabbed hold of an alder branch with one hand while holding my bow in the other and pulled myself up as quietly as possible. As soon as my head got above the ridge a stiff breeze hits me in the face. I knew the wind would be good but I didn’t realize it was blowing so hard. Perfect! Both knees are now on the top of the ridge and I’m looking through the alder at the bear lying on a snow patch with his head pointing away from me. He is less than ten yards from me but there is alder between us. I needed to crawl about four feet to have an open shot. Slowly moving one knee at a time and I am there. The angle of the ridge is going down from my left to my right. Because of that angle as I draw my short Kodiak Magnum bow, the bottom limb still hits the ground so I have to shoot with the bow parallel to the sloping ground. All of a sudden the bear rises and turns his head and we are staring eye to eye. I full draw and let the aluminum shaft arrow fly. It goes into the bear and he dives over the ridge. I love black bear hunting and for the first five or six years that I lived in Alaska I went on more black bear hunts than any other hunt. They may have been for only one day but I went at least four or five times every year. Some of these hunts weren’t the most successful mainly because of their duration. However, they got me out of the house after a long Alaskan winter. The place where I spent the most time chasing black bears was the Kenai Peninsula. Every spring, usually starting too early I would drive down the Seward Highway stopping along the side of the road at all of my favorite south facing slopes and glass the hillsides while leaning against the vehicle. Those south facing slopes are where the first grass shoots start to grow, especially in the avalanche chutes. Those chutes are always a great place to watch and glass. These tender grass shoots are one of the bears’ favorite spring food. I usually did two or three one day hunts with one or two of my Air Force buddies. We used my old yellow ‘59 Ford station wagon during the early years. Then in the early ’70’s I had an old Chevy pickup with a shell that we would use. Around the last weekend of May after much of the snow was gone we would always do a weekend hunt packing into one of the numerous valleys. In the fall we watched the upper hillsides above the brush or timber line for bears eating berries. You basically hunted them like you were goat hunting except typically you didn’t need to climb any cliffs. 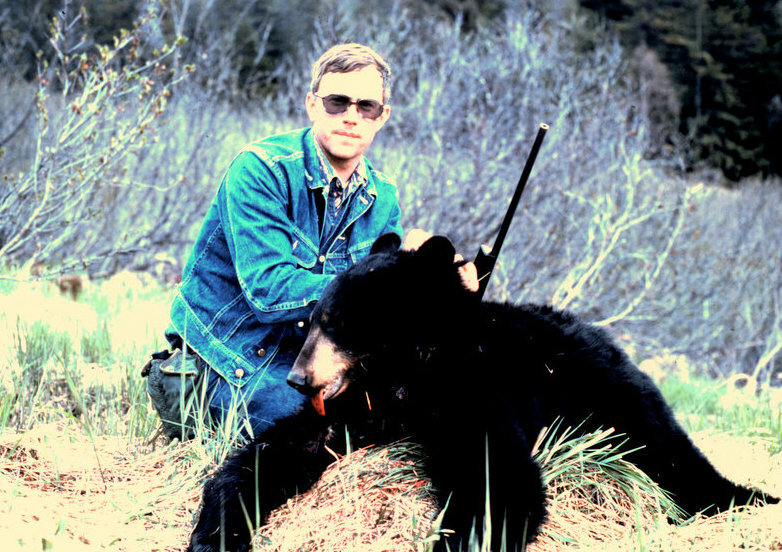 My first black bear taken September '67. Doug Simmons with his first black bear the spring of '68. Walter Burkett, a high school friend stationed at Elmendorf, with a "kid" goat. We spotted a bear close to a nanny goat and made a stalk. The bear got our wind and took off. The nanny had hid her "kid" in the brush and as we came down the hill the "kid" came out. I harvested my first black bear in September ’67 on a fall goat hunt in the Gulch Creek drainage. I was with a couple of my hunting buddies when I spotted a bear late in the afternoon eating berries on one of the ridges where we had previously taken a goat. I took off by myself on a 1200’+ climb and stalked to within twenty-five yards of the bear. The wind was perfect and I was able to use a good sized bolder for cover. I made a good clean shot with my trusty .300 Winchester Magnum. I used my preferred bullet at the time, a 180 grain Winchester Power Point. I used those bullets on every animal taken during my first fifteen years in Alaska. I never had a complaint. The bear ran toward me not knowing where the bullet had come from and fell about ten feet from me. My buddies were watching and thought the bear was charging. Since it was mid-September it was dark by time I took my pictures and skinned the bear so I laid by the bolder and used the bear skin to cover up with and slept there that night. It was a beautiful night and with the bear skin covering me I was way warmer than most of the other nights that I spent without a sleeping bag. Mike Herbert with his bear that he took on one of our one day trips down on the Kenai Peninsula. Earl and Marv in Earl's Folboat going across Upper Trail Lake. One of our many trips. Somewhere around the spring of ‘72 we started doing weekend bear hunts around Upper Trail Lake. It was a great area. When the ice was off of the lake we would take our Folboats, canoes or other small boats to the back of the lake and go under the railroad trestle to a small lake next to the railroad tracks. If the lake was still covered with ice we would walk down the tracks from Moose Pass to that same spot. It was a six mile hike down the tracks. There were usually two or four of us. I did at least six or seven of these hunts over the years. Russ Langston with his bear taken down the tracks from Moose Pass. In May of ’74 I was working on getting my Commercial Pilots Certificate and was trying to build hours in a Cessna 172. We were planning a weekend black bear hunt so I took my friend Marv Buckley spotting with me. It was a great spotting trip and I believe we spotted at least twenty five black bears. Three or four of them were down the tracks about ten miles from where we usually hunted. We decided to go for it. It was going to be a three day weekend hunt so we loaded the Folboat on top of my truck and headed down to Upper Trail Lake. We paddled across the lake and back to the small lake and then hid the boat. We strapped on our packs and headed down the tracks toward Grandview. We walked about nine miles and set up camp just off the tracks in a nice wooded area. There was an eight foot bank without trees by our camp. We sat there and glassed the southern exposures. It was a perfect camping spot. The next day we spotted a bear a mile further down the tracks and about a 1000 feet up on the hillside. It was lying on a patch of snow on a ridge above an avalanche chute. We decided that I would try for him with my bow. Marv stopped about 150 yards below and to the left of the bear and got set up in case the bear spooked or if I made a bad shot. My 5'6" black bear that I took with my Bear Kodiak Magnum bow. Marv "Buck" Buckley with his 6' black bear. We pick up the story with the bear diving over the ridge. I never yelled good shot or bad shot and the bear was gone. Marv yelled, “Was it a good shot?” I yelled, “I’m not sure! !” I made it to where the bear was laying and looked over the ridge. Less than 20 yards down the chute laid the bear. I yelled, “Good shot, he is lying right here!” I had finally taken a black bear with my bow. The Wasp arrowhead had gone from the mid-section through the heart and as the bear rolled down the chute it basically took out his lungs and almost gutted the bear. It wasn’t a giant, just a 5’6” or an average black bear in Alaska. It was however a spot and stalk kill with a recurve bow without sights. I felt good about the kill. We took our pictures and skinned the bear and made it back down to the tracks. We found us a good place to sit and glass and late that afternoon we spotted a bigger bear below where I had taken my bear. We made a good stalk and Marv killed a beautiful 6’ boar. That was his first bear. The next day we were glassing the hillside and all of sudden a pack of nine wolves came out of the trees less than 75 yards in front of us. They moved across the field and went back into the trees. Those were the first wolves that I had seen while in Alaska. The season was closed so we could only get excited about just seeing them. Cool sight! Marv and me with our bears spread on the snow. A great hunt! We left the next day returning to the boat and then paddled back across Upper Trail Lake, loaded the truck and headed for Anchorage. Me right before we got to the Folboat. A long pack on the tracks. Marv in my Folboat right before we headed home. Great memories that will last a lifetime. Once I started guiding I didn’t get to do any more spring black bear hunts, but after I retired when those beautiful sunny April days start melting the snow I get the urge bad. I started volunteering at the Downtown Soup Kitchen in early 2006. I became good friends with Marty Turnbow. We were always talking hunting while making the sandwiches and I told him we should plan on going black bear hunting. He agreed and we drove down to the Kenai mountains looking on those southern slopes. Over the next couple of years we made several trips down the beautiful Seward Highway. We had some great times, spotted a few bears, made a few stalks and then the fall of 2010 Marty killed his first black bear. It was a beautifully furred 5’8” bear that we caught eating berries on the hillside. We made a great stalk to within 50 yards. That was the last black bear kill that I was in on. Jared, my grandson, and I try each season to drive down the Seward highway glassing the slopes as he would like to take a bear with his .30-30 Winchester Model 94. Marty and me with his black bear. Another great memory of a fun hunt with a good friend. Its mid-April, the sun is shining and snow is melting. I can hardly wait until May to drive down that highway one more time with my grandsons checking out those southern slopes for those wonderful black bear. Life is good! !